Place the mushrooms and water in a small bowl and set aside for 5 minutes to soak. Finely chop the mushrooms and return to the liquid. Heat the olive oil in a large saucepan over a medium heat. Add the onion and garlic and cook for 4–5 minutes or until soft. Add the rice and cook for 2 minutes or until well coated. Add the mushroom mixture, stirring constantly, for 1–2 minutes or until combined. Add the stock, ½ cup (125ml) at a time, adding more only once liquid has absorbed, and cook, stirring constantly, for 25–30 minutes or until rice is al dente and all the liquid is absorbed. Add the butter, parmesan, salt and pepper and mix to combine. Transfer to a baking tray lined with non-stick baking paper and spread evenly, placing a second sheet of baking paper on top and transfer to the fridge to cool completely. Place the flour on a small plate, the breadcrumbs in a medium bowl and the egg in a small bowl and set aside. 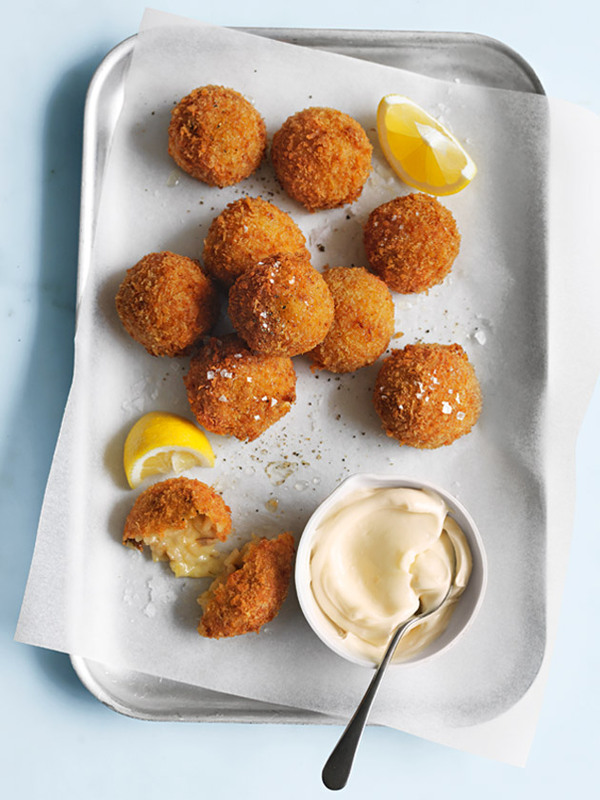 Roll tablespoonfuls of the rice mixture into balls, pushing 1 piece of bocconcini into the centre of each ball. Dust each with the flour, dip in the egg and roll in the breadcrumbs to coat. Half-fill a large saucepan with the vegetable oil over medium heat until the oil reaches 180°C (350°F) on a deep-frying thermometer. Cook the balls, in batches, for 2–3 minutes or until golden. Drain on paper towel. Sprinkle with salt and serve with the lemon and aioli. Makes 16. + You can make the rice mixture up to the end of step 2 and keep in the fridge for 1–2 days. + Porcini mushrooms can be found in supermarkets or specialty shops. They can be substituted for 200g button mushrooms, finely chopped.